Well, as the passage of time dictates, “next week” is now “this week.” So let’s do this. The effect we’re going to look at is the revelation of the color of your spectator’s prom dress. Let’s say the method for the effect is an impression pad or a peek. Okay. So you know the color of the dress she wore. Now let’s plug that into the five causes. Now, “No Cause” doesn’t necessarily mean bad. This would be a fine trick as it is. (Although it would require you to have a secret bandoleer of Hot Rods that you have access to.) The problem with “No Cause” effects is that there is nothing beyond the effect itself to really connect with a spectator. No Cause effects are like a one-night-stand: fun, but not meaningful, and often forgettable. This is just nonsense, and will be ignored as such. This is “unfulfilled,” because you’re saying the cause is your “strong connection.” But you’ve done nothing that would imply you established that connection or suggest why you and the other person might have such a connection (are you from the same town? do you like the same movies? were you born on the same day?). “We have a strong connection,” is meaningless without establishing or justifying that connection. Pseudo-Psycho Analysis - “Well, I know you like to stand out in a crowd, so I don’t think you’d wear black. But I also know you like to stand-out because of your personality more-so than just how you physically present yourself. So I don’t think you’d wear anything outlandish. So…hmmm… I think it would be a bright color, but not too flashy. There was probably something unusual about the dress. Maybe it was vintage? I’m not sure. Okay…I’m going to commit myself. I think it was a yellow dress. I hop in the closet and pop out three seconds later. 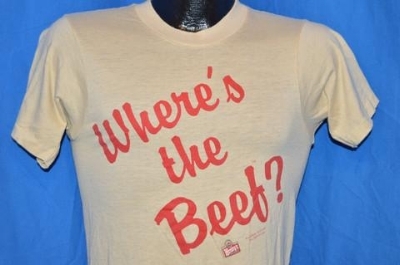 My shirt has changed from a plain grey t-shirt to a “Where’s the Beef” shirt. I’m wearing 80s sunglasses. And drinking from an old can of Jolt cola. She smiles and throws her head back. The “unbelievable cause”—which here is time travel—is the foundation of the Romantic Adventure style. This style is based on an interactive fiction you engage in with the spectator. It’s the style that, in my experience, people find the most enjoyable and memorable. And yet it often puts the least amount of emphasis on the trick itself. You place in your spectator’s hand a small, smooth, cloudy white crystal. You have her hold the crystal between her hands. With your hands, you start “brushing” energy from her head, down her neck, down her arms and into her hands. You do and look up with a bit of a smile. “Was your dress green?” you ask. She opens her hands and now the crystal is a pale green. “That’s so crazy,” you say, shaking your head. The idea behind the Mystery Cause is that you are either not spelling out the nature of how this effect is happening, or claiming you don’t really understand it completely yourself—there’s some mysterious element to it. And rather than give them a Cause that is believable or unbelievable, you are presenting a void for them to fill in whatever way makes them happiest. They can choose to believe it’s a trick and you’re screwing around, or it’s a real mystery, or somewhere in-between. The method here would just amount to having 4 or 5 crystals of different colors that you could switch in for a clear crystal as you put it in someone’s hand (using any type of coin-switch that might work with the crystals). If you peek the color and you realize you don’t have a matching crystal, then you just do something else with the information (you don’t commit yourself to the presentation until you’ve peeked the color). Okay, so that’s how one effect can look after being run through these different “Cause” filters. This should give you some idea of what type of Causes you’re drawn to, and help you in coming up with presentations that fit the type of magic you want to perform. At least it does for me. And that’s ultimately the first step in coming up with your own presentations. I’ll have some final thoughts on this concept (final for now, that is) next week.